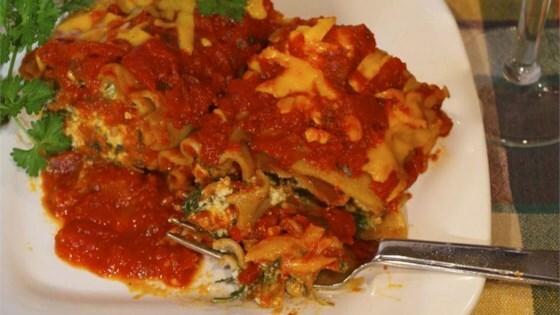 "These delicious rolls use low-fat cheeses, egg whites, and whole wheat lasagna noodles to increase their nutrition. The noodles are rolled around a ball of filling, as opposed to spreading the filling over the noodle. The technique is quicker and not as messy and results with nice looking cannoli-type roll." Bring a large pot of lightly salted water to a boil. Cook lasagna noodles in the boiling water, stirring occasionally, until cooked through, about 8 minutes. Drain. Brown ground turkey with garlic in a nonstick skillet over medium heat, breaking the turkey up as it cooks, until no longer pink, about 10 minutes. Stir spinach, chives, oregano, parsley, and basil into ground turkey mixture, cook until heated through, and remove from heat. Lightly beat egg whites in a bowl and mix ricotta, feta, and Parmesan cheeses into beaten egg whites. Season with black pepper. Stir ground turkey mixture into cheese mixture. Lay cooked lasagna noodles flat onto a sheet of waxed paper. Divide filling into 8 equal portions and roll the filling into balls. Place a filling ball on one end of a noodle and roll the pasta up around the filling; repeat with remaining noodles and filling. Spread a thin layer of pasta sauce over the bottom of a 9x13-inch baking dish; place rolls into dish with seam sides down. Pour remaining pasta sauce over rolls and sprinkle with Cheddar cheese. Cover dish with aluminum foil. Bake in the preheated oven until cheese topping has melted and the sauce is bubbling, about 40 minutes. To divide filling easily, press flat with hands into bottom of bowl. Use a knife to roughly cut filling into 8 'pie slices.' Then take out one section and roll it into a ball. I used my own homemade sauce & a full pound of ground turkey. This was the easiest lasagna recipe and really tasty. I served it to guests on the first try and luckily everything turned out! The taste deserves a five, but there was so much cheese and not any vegetables so it's not very healthy. pretty easy to make. the kids loved it.